The estimated 44 million immigrants in the United States are better educated than ever, due in part to rising levels of schooling in many of the countries they came from and an influx of high-skilled workers to the U.S. in recent years, especially from Asia. In 2016, 17.2% of immigrants ages 25 and older had a bachelor’s degree and another 12.8% had attained a postgraduate degree, according to a Pew Research Center analysis of U.S. Census Bureau data. Both shares are up since 1980, when 7.0% held a bachelor’s degree and another 8.7% held a postgraduate degree. Compared with the U.S.-born population, immigrants are about as likely to hold bachelor’s and postgraduate degrees, though this varies by country of origin. In 2016, 30.0% of immigrants ages 25 and older had a bachelor’s degree or higher, compared with 31.6% of the U.S. born. The educational attainment of U.S. immigrants has improved in recent decades for a variety of reasons. Each year, thousands of immigrants temporarily work in the U.S. under the federal government’s H-1B visa and Optional Practical Training programs, the two largest sources of new temporary high-skilled immigrant workers. Each requires some level of college education. More broadly, education levels have increased in many parts of the world as nations have invested in their educational systems. One result is that global literacy rates among people ages 15 and older have increased from 56% in 1980 to 85% in 2014. It remains to be seen how changes to H-1B visa application reviews enacted in 2018 – and any other possible changes to the nation’s immigration system – will shape the U.S. immigrant population in the future. Changes in the origins of U.S. immigrants in recent years have also contributed to the increased share with a college education. In recent years, Asia has surpassed Latin America as the largest source of newly arrived U.S. immigrants, in large part because immigration from India and China has increased steadily while immigration from Mexico has declined sharply. This follows one of the largest mass migrations in modern U.S history, during which more immigrants came to the U.S. from Mexico than any other country in the world. Overall, 11.6 million Mexican immigrants and 11.7 million South and East Asia immigrants lived in the U.S. in 2016. More than half of immigrants from South and East Asian countries (52.1%) had a bachelor’s degree or more in 2016, which is in part explained by Asian countries being the largest source of foreign college graduates who stay to work in the United States. Asian immigrants also make up a majority of H-1B visa holders and foreign students. 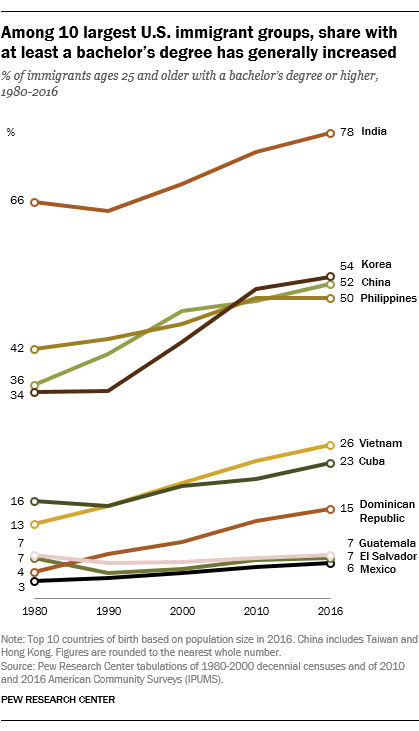 Latin American immigrants, by contrast, tend to have lower levels of education. The vast majority of Mexican immigrants (81.2%) and Central American immigrants (74.6%) had a high school degree or less, the lowest educational attainment level of any origin region. Education levels have generally risen since 1980 among the largest U.S. immigrant-origin populations. More than three-in-four immigrants ages 25 and older from India (77.5%) had a bachelor’s degree or higher in 2016 – the highest share of any top origin country – up from 66.1% in 1980. Meanwhile, immigrants from Korea, which is second to India, have had the biggest increase in educational attainment among those ages 25 and older. The share of Korean immigrants with a bachelor’s degree jumped from 34.4% in 1980 to 53.6% in 2016, a 19-percentage-point increase. By contrast, the share of Mexican immigrants with a bachelor’s degree or higher has increased by only a few percentage points since 1980, reaching 6.2% in 2016. However, the share of Mexican immigrants ages 25 and older with a high school degree has more than doubled, from 11.4% in 1980 to 25.2% in 2016. Today, the U.S. has more immigrants than any other nation in the world. About 13.5% of the U.S. population was foreign born in 2016. This share has been on the rise since 1970, when it was at a historic low of 4.8%, but it remains below the record of 14.8%, reached more than a century ago in 1890. 6 key findings about black immigration to the U.S.